Lead by example: If you’re ducking out at 3 p.m. and regularly taking long weekends, it sends a subtle message that this kind of behavior is okay. If you want your employees to be more focused than ever, then you should be too. Don’t shut down all in-office fun: While work must get done, you don’t want to be the office Scrooge either. 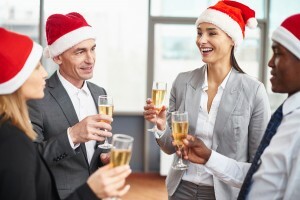 Reward your employees for their consistent commitment to the company by throwing a small holiday party, giving them an extra day off, or gifting them with a small token of your appreciation. Tackle issues before they escalate: If you notice that someone is having trouble staying focused, don’t just hope that they’ll rediscover their motivation at some point before the year ends. Instead, tackle the problem before it’s allowed to grow and become a major disruption in the office. Have a conversation with the employee and explain your concerns, then quickly come up with a solution. Come from a positive place: If you’re constantly lecturing your team about how they’re getting nothing done, this eventually is going to take its toll and hurt morale. While it’s okay to provide criticism when needed, don’t forget to offer words of praise when deserved too. Lastly, the holidays are a good time to reinforce your company’s values and vision. When everyone in the office knows what they’re working for, it helps to bring extra energy and excitement into the building each day. How do you keep your team productive and energized during the holidays? Let us know in the comments.